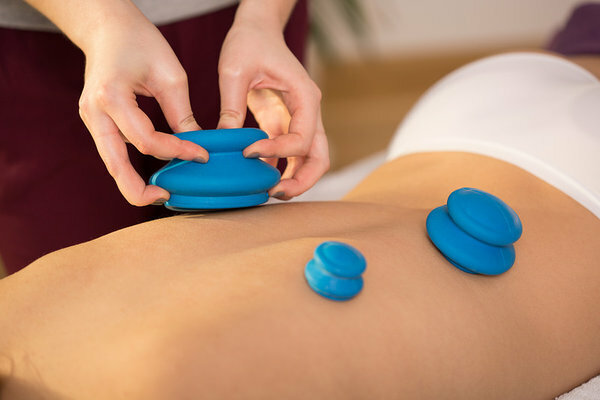 Cup massage or therapy is also a Chinese traditional medical treatment. It is used to treat various illnesses and alleviating pains. It's good against and neck, back, ligament pains and headaches, treating the cold, treating cellulite, improving blood supply and preventing illnesses. The cups are either used for massaging, or are just placed on problematic areas and left for 5-30 minutes. The idea is to help Qi or the energy of life start moving along the meridians and any "blocks" in the body. The therapy also helps release any residue from your body. During the therapy, blue spots may appear on your body. The time for them to disappear varies by individual, but usually it takes 3-14 days. Resting is recommended after having the massage: don't go right outside in the cold and windy weather, but let your body cool down. Drink more water, preferably warm water or tea, to help any residue leave your body faster. Don't drink alcohol. The cup massage must not be performed while suffering from severe illnesses: either heart conditions (rhythm disorders, heart pacemakers) or other serious conditions. The cup massage must not be performed if the treatable area has a severe inflammation, psoriasis, varixes, large birth marks, also during pregnancy and breastfeeding and after a surgery. If you're not sure, consult with your doctor.